This Creative Cloud release includes a new Creative Profile that connects creatives to their work, to the assets they use to create, and the communities that matter to them – no matter where they are. 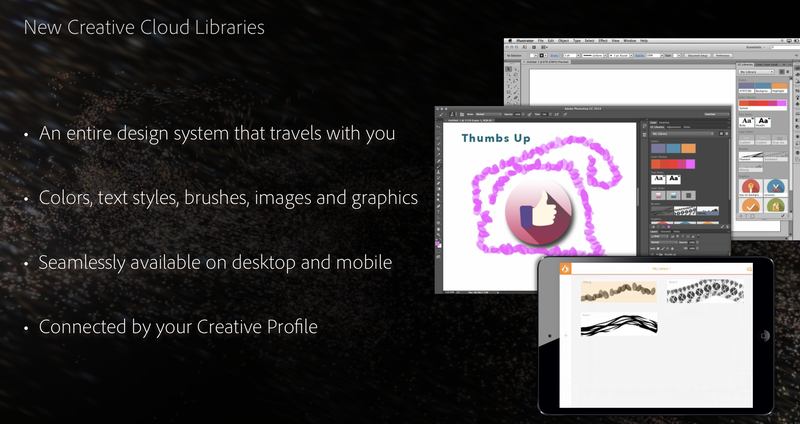 Files, photos, colors, brushes, shapes, fonts, textstyles, graphics, and any other assets are always at their fingertips. This new Creative Profile moves with creatives from app-to-app, and device-to-device, so assets automatically appear when they need them, in the right context. Ahead of its annual MAX Conference kicking off today, Adobe has launched an entirely new suite of apps that are now available on the iPhone and iPad App Store. This year, Adobe is focusing on simplifying its mobile software lineup into four categories that sync with desktop counterparts: Illustration, Imaging, Video, and a new platform called Creative Cloud Capture Apps. Each of the apps within the four categories are either brand new or have been enhanced. Update: Apple confirmed the use of China Telecom servers in a statement to the Wall Street Journal. But the company said Friday in a statement to The Wall Street Journal that all data stored is encrypted, meaning China Telecom won’t have access to its content. “Apple takes user security and privacy very seriously. We have added China Telecom to our list of data center providers to increase bandwidth and improve performance for our customers in mainland China,” it said. Apple has begun using Chinese data centers to store iCloud data for local Apple customers, the first time Apple has used mainland China for iCloud account and information storage. On a municipal government website, Fuzhuo City Telecom said that ‘Apple China has completed the iCloud data dump into China Telecom’s cloud services’. The post has since been taken down from the government site, however. Don’t count BlackBerry out just yet. In spite of their buyout addition to their buyout offer from Fairfax Capital for $4.7 billion late last month, the telecommunications company today announced plans at the Gartner Symposium in Orlando, Florida, to launch a new cloud-based system for managing users and applications across BlackBerry, Android, and iOS. The cloud service ambitiously plans to address the ‘bring your own device’ movement while addressing privacy and tech support at ‘less than a cup of coffee a month,’ according to BlackBerry. Apple rolled out Apple TV update 5.2 in January, bringing Bluetooth keyboard support, Up Next, and an enhanced iTunes in the Cloud service alongside iOS 6.1 for iOS devices. Today, FireCore announced it has released updates to aTV Flash (black) and Seas0nPass that support the new 5.2 update. FireCore’s aTV Flash software enables jailbroken second-generation Apple TVs to support additional file formats, access a web browser, and much more. To the delight of many loyal users, Apple officially added support for Bluetooth keyboards in Apple TV 5.2, and we’ve been working non-stop to provide a seamless experience in aTV Flash (black) 2.2. Now features such as web browsing, media playback, library browsing and more can all be controlled using a wireless keyboard. Don’t worry, the normal remote will still work as well. What’s the best way to update? aTV Flash (black) 2.2 is compatible with any ATV2 running 4.4 and later, so updating to 5.2 is not required. However, should you so desire, the best way to update can be found below. Backup your settings through the Maintenance > Manage Backups menu. Run the latest version of Seas0nPass to update the Apple TV to 5.2. Download and install the new 2.2 version of aTV Flash (black). Install any desired items through the Maintenance > Manage Extras menu. Restore the previously saved settings through the Maintenance > Manage Backups menu. Amazon just launched its Cloud Drive app for Mac and Windows. The Amazon Cloud service unveiled last year, but now users can play with the desktop app counterpart, rather than their browser, to manage files in the cloud. Folders and files can transfer in the background, but the service does not support syncing or a native desktop browsing client like Google Drive, Dropbox, SkyDrive, and SugarSync. Cloud Drive offers all customers 5GB of free online storage with unlimited access from any computer. Additional storage plans start at 20GB and extend to 1,000 GB. Unlimited music space is currently available with any paid Cloud Drive storage plan for the duration of an existing plan term. Click here to start installing the free Mac app now. The install is easy, as seen in the gallery below. There are a few ways to get a file or folder into Amazon’s Cloud once the app is installed: Just drag and drop to the new Cloud icon (looks similar to iCloud) in the Menu bar, or right-click/control-click on files and folders to see a new menu item that allows uploading.